Q: What is radon and why is it a concern? Radon is a colorless, odorless, tasteless radioactive gas that comes from the breakdown of naturally occurring uranium in the soil and rock. Radon enters homes through openings that in contact with the ground like cracks in the foundation and slab, opening around pipes and sump pumps. Radon is the second leading cause of lung cancer in the U.S.A. resulting in 15,000-22,000 deaths per year. The more radon you are exposed to and the longer the exposure, the greater the risk of eventually developing lung cancer. The New Jersey Department of Environmental Protection (DEP) recommends that all homes be tested for radon. Total Home Inspection Services will do a thorough NJ Radon Testing on your home. Q: How do you test for Radon? A single term test of 2 – 7 days can be used to determine the radon level in your home. This is usually done at the time of of the home inspection and should be carried out by a licensed technician. The licensed technician should install the test and pick it up. All inspectors with Total Home Inspection Services are licensed by the state of New Jersey to perform radon tests. Q: How is the test conducted and what are the requirements? Normally for a real estate transaction, a charcoal cannister is placed in the lowest potential livable level of the home. This would include the first floor of a home without a basement, a finished or unfinished basement, but not a crawlspace. All windows and doors in the house should have been closed 12 hours prior to the place to the placement of the test and throughout the longevity of the test. Doors can be opened for exit and entry, but not left open. Please note it is all windows on every level of the home that should be closed, not just those in the basement. Air conditioning units can be used if they circulate inside air. Attic, window fans and fireplaces should not be used during the test. Q: How do I interpret the results? Radon is measured in picoCuries per liter (oCi/L). How much radon is in a liter of air? The DEP and Environmental Protection Agency (EPA) recommend that you take action to mitigate your home if the test indicates radon level over 4.0 pCi/L. Q: How do I remediate high Radon levels? The most common type of remediation is the sub slab depressurization system. This system uses venting and sealing to lower radon levels in the home. A pipe is installed that runs from below the basement flooring out the side of the foundation where a fan is installed that draws radon out from under the slab up through the pipe that extends above the roof line into the air. 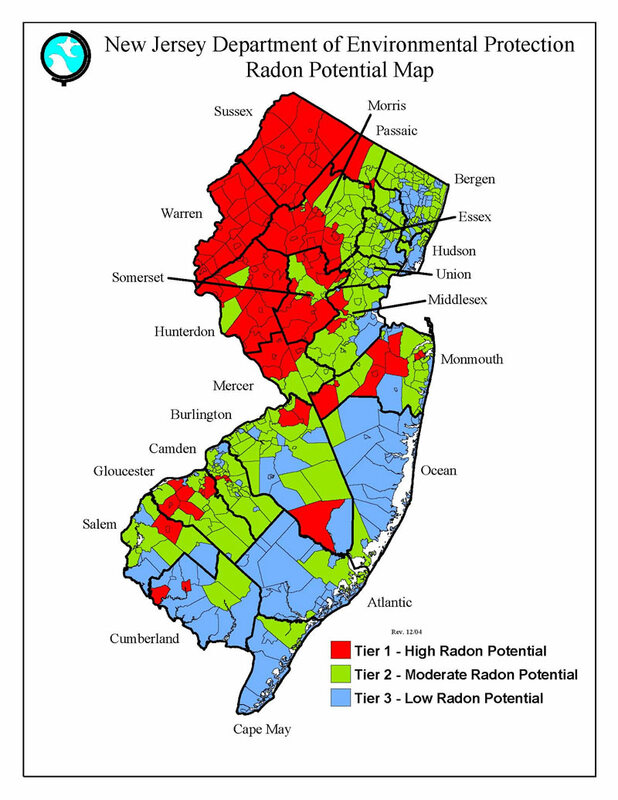 The New Jersey Department of Environmental Protection has provided the following map that shows the various levels of radon potential throughout the state. Total Home Inspection Services performs NJ radon testing.